The common feature that runs through the recent solo exhibition (up through September 30, 2011) of work by Los Angeles–based artist David Jang is repurposed material, which the artist has used to create a small installation piece, a wall sculpture, and two-dimensional pieces. What is most refreshing is Jang’s creative refiguring of his chosen mediums and objects; their original purpose or configuration is not immediately evident. More to that point, the work isn’t reliant on this eco-trend; it’s not defined by the recycling, only provided with greater depth. Two pieces in particular are exemplary in this regard: Novelty and Proliferate. The former is a sculpture that comprises seven variously sized Hydrangea-like, half-sphere silver forms—created with inside-out chip bags. Taken at face value, the piece bursts with shiny complexity—the organic shape juxtaposed with the man-made metallic sheen. Factoring in the material as chip bags adds an element of festivity or community (one can imagine a party of chip eating to provide the artist with the needed materials; the tight gathering together of the bags also contributes to this idea of community). 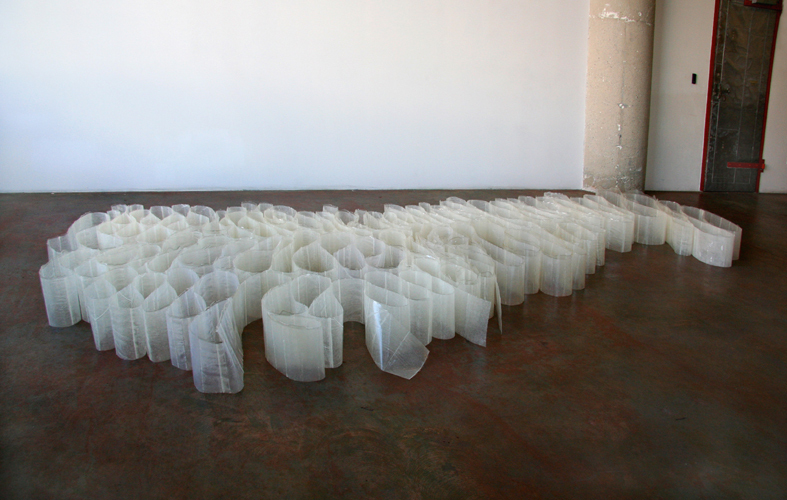 Much quieter, Proliferate is a long off-white/yellowish ribbon-like piece that snakes back and forth in loopy zigzags, standing up on its thin edge; for this work, Jang covered a roll of paper towels in resin. Simple, beautiful, and moveable. Several other works in the exhibition are made from large pieces of wood, covered, at least partially, with a layer of deconstructed/flattened soda cans, with circles repeatedly etched into the surface. These rough, heavily textured works—and explorations of form, pattern, and composition—speak to the artist’s interest in portraying the cyclical nature of being, of life, and repetition (not only does Jang use the same shape over and over, but his use of multiple iterations of the same types of objects in one piece—cans, bags, etc.—also addresses mass consumption and throwaway culture). The rusty patina, while adding subtle color, also speaks to progression, aging, and renewal (these cans are experiencing a new beginning as an artwork). While repurposing materials and formal explorations aren’t groundbreaking endeavors, Jang brings, especially to the former, a unique, playful aesthetic worthy of thoughtful contemplation. Full disclosure: I knew this show would be good before I viewed it. Not to say I didn’t give it a critical look-over, but rather, given Julie Heffernan’s track record, some preliminary jpgs, and reception of work from the same series that showed last year in New York (at PPOW; the current show, on view through October 29, 2011, includes newer works), it was clear to me that this Brooklyn-based painter had another hit on her hands. Heffernan’s work here, as in the past, is richly detailed and brilliantly colored—a riot of reds, oranges, yellows, and greens pervade. They reflect the artist’s lyrical talent with the medium along with her beautiful imagination. Heffernan is able to deftly relay unique, fairy tale–like visions of her world. These works are autobiographical and strongly rooted in art history. The visually luscious Old Master style riffs off traditional still live symbolism—a pile of dead birds sit upon a central female figure’s lap in “Self-Portrait with Talking Stones” (2011) for example. These symbols of abundance, feast and nourishment are presented and brought into the present with a good dose of surrealist dreaminess. Variously, rocks float in the air; a figure wears a headdress of fruit; the ground is folded up like a bundle of cloth. Akin to Heffernan’s earlier work, these paintings feature a singular, centrally placed figure. But whereas before the figure was always female (and a self-portrait), several of these new works feature a young man who, it turns out, is her son. The back-story: Heffernan’s son is leaving for college. 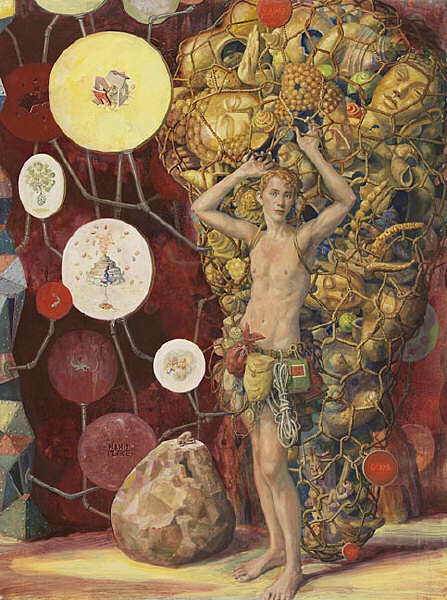 In one painting, “Picking Up the Pieces” (2010), this central figure has on his back a huge bundle collected into a rope net; around his waist is a tool belt stuffed full. The symbolism is clear—he leaves with baggage but also the tools to deal with the challenges ahead (off to the side there is also a rock and next to it a sign that reads “Hard Place”). In another work, “Self-Portrait with Falling Sky” (2011), Heffernan contemplates her new state of uncertainty: rocks hover and float around the central female figure, none of them, however, touching her. Her world is up in the air, but there is the sense that it’ll all work out right. Heffernan’s works not only feature the overarching symbols, surroundings, and objects that speak to the storyline the main character is engaged in, but also comprise numerous vignettes that may or may not seamlessly gel with the larger narrative. They’re tangential offshoots or breaks that keep us on our toes—and sometimes they are so well integrated in the visual abundance of the work, they may not get noticed until a second, third, or fourth look. Many of these scenes or images are inspired by NPR, which Heffernan listens to almost constantly, providing a topical twist to the work, which, because the origin is a mass-media source, might well resonate with that audience. All but one (a limited edition print) among the thirteen works are oil on canvas, and mostly large in size. As a group they embody a visually complex and stunningly rendered timeless tale of the human condition that continues to reveal fresh details over time. Apocalyptic American landscapes fill the walls in Philadelphia-based artist Alex Lukas’s current exhibition (on show through October 8, 2011). The twenty-five works here range in size from 6-by-10 inches to 25-by-72 inches. The undisputed centerpiece is an enormous cyclorama in the center of the gallery that measures 4.6 x 33 feet; the work is displayed in an arc that surrounds the viewer so that it encompasses one’s entire field of vision. Two types of scenes are presented here. Metropolis-scapes appear underwater, overtaken by lush vegetation and what appear to be decaying swampy suburban areas. The revisiting of very similar imagery does become repetitive is too frequent, causing the initial emotion response to dissipate. The cyclorama features the second, suburban-y scene. The format itself is significant not only because of its grand size but also because its original message juxtaposes powerfully against its message here. Cycloramas were a format used during the 19th century to display scenes that commemorated national strength, such as battles won; here it envisions the ultimate power as nature (to the demise of a superpower). It is tempting to extrapolate that the action in the original cycloramas (e.g., war, striving for ultimate power) may well lead to the condition presented in the current cyclorama. In all of the works there is not a human in sight, but there are traces everywhere, in the form of buildings, deteriorating billboards, and graffiti. The latter is especially poignant, pointing to what is often the most enduring and powerful form of communication to distant generations and after general destruction: writing on walls. That graffiti might be the only surviving remnants of man amounts to the proverbial “writing on the wall”: we should have seen this coming. What is particularly striking in these works, as opposed to other end-of-days art (think Sandow Birk’s series The Rise and Fall of Los Angeles or Albrecht Dürer’s The Four Horsemen of the Apocalypse), is that the images feel peaceful. Waters are still and clear. There is no fire; there are no explosions. Trees and bushes are healthy and abundant. Doom is paired with serenity. Brion Nuda Rosch presents twenty-three new works ranging from a large diptych painting to numerous smaller collages (through October 1, 2011). 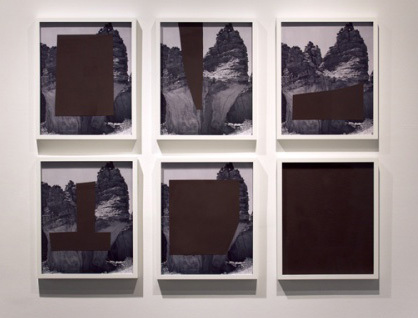 Many are reminiscent of the work Rosch has shown over the past few years, featuring a found image, often of a black-and-white landscape, with a painted, cut-out, four-cornered form placed on it. The form in these works is painted flat brown, perhaps a stand-in for the earth, or some sort of firm grounding. These and other works play with formal concerns such as foreground and background, form, and composition. Perhaps the most poignant piece of this ilk is the sextet of same-sized works, arranged grid-like in three columns of two, Time as Concept (Infinity). The background image is the same in every piece; the brown shape is the only variable, changing in size and form. In the lower-right-hand work (the “last” piece) the brown shape fills the frame. What, then, is the image? Is this, or where is, the content? By showing us “something” and then “nothing,” Rosch effectively demonstrates what is at the heart of his work; he questions the foundations of image-making. At times Rosch’s minimalist approach becomes too minimal, as with the piece Two Right Angles in Conversation, a framed cut-out piece of cardboard with rough strokes of brown paint on it. We consider the form, and move on. But when he’s on point, which he is numerous times in this show, Rosch provides us with sharply edited works that simply, elegantly address major concepts with a minimum of fuss.